Home » News » If you weren’t there, you missed out! If you weren’t there, you missed out! Heatley’s words, not mine. But I agree wholeheartedly. The Festival of Small Halls was our first sojourn into folk territory. And what an introduction! Not only was it in our home town, surrounded by almost 200 familiar faces and a wonderful sense of community, but everyone there would have had to have been impressed with the calibre of talent. And chilled. It was a night to sit back, and let the music wash over you. Just refreshing – how often do we stop to enjoy the finer things in life? Lead performer Vance Gilbert from the USA said, “It was a success on all levels.” He said that the tour was fostering communities – and bringing original folk music to rural areas of NSW and Queensland. He brought lots of smiles too – with his Halloween poem and witty rejoinders to the audience. That cry did sound like air escaping from a balloon. Another powerful performance was Aussie act Liz Stringer, from Melbourne, who sang out her soul for us – we loved her introductions to each song, personalising it for the audience. Organiser Brooke Bignall said the night was well received: “We’re happy about the demographic – from families to older generations. That was nice. As well as ABC Radio (we were the concert to be recorded in the tour) some of the team from Woodford Folk Festival also attended. Brooke said their whole motto is to go to forgotten halls and take artists who are less well known, as well. She was also pleased we sold as many tickets at the door as we had online, a total of 136 adults, which covered the Rainbow Beach Commerce and Tourism investment of bringing the event here. RBCT members also recouped costs from the popular bar and indicated they would be happy to sponsor more nights like this. 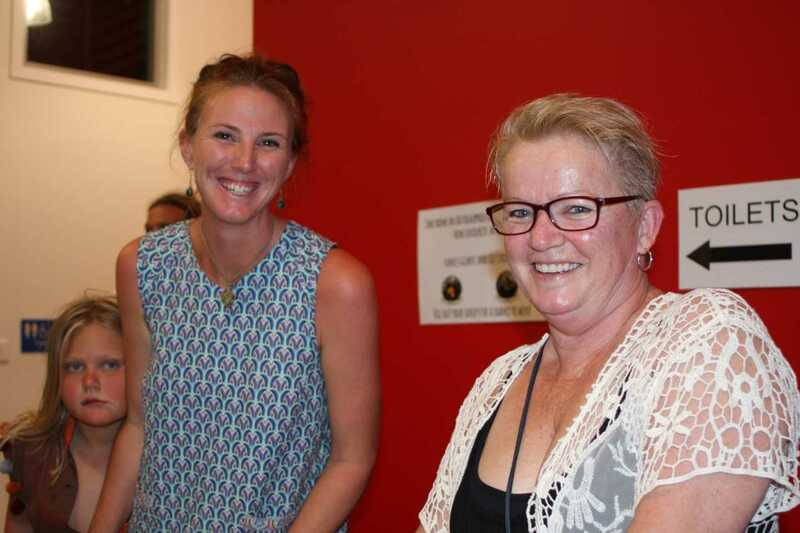 The Cricket Club did well with their burgers – impressing some guests that they offered a vegetarian option, and the, MC Kirstie Jordison (also P&C President), said the P&C mums at the dessert bar raised about $300. Brooke thanked everyone for the local support. Produced by the same organisation that runs the Woodford Folk Festival, we really hope you come again next year!